It’s never a good sign to have your air conditioner leaking fluid. It could be condensate, which isn’t that big of a deal. It could also be refrigerant leaking, though, which is a big problem for your air conditioner. Refrigerant is the liquid the system recycles to cool your home. As the refrigerant level in the air conditioner drops, the system’s cooling ability will drop as well. If the lost refrigerant is not replaced, the air conditioner will eventually break down. Make sure you call a professional if you notice fluid leaking from any part of your air conditioner. If your air conditioner isn’t blowing enough air, it could indicate a number of different issues. 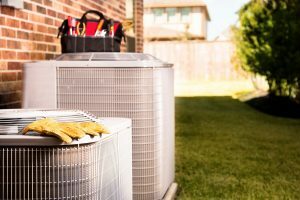 You might have a problem with your air handler, which is the part of your air conditioner that is responsible for circulating air throughout the home while the system is running. You could also have a clogged air filter, which is the best-case scenario for an issue like this. In that case, all you need to do is to change the air filter. Regardless, you should consult with a professional if you notice this symptom. It could end up being more serious than a simple clogged filter. Short cycling is an issue that causes your air conditioner to turn on and off every few minutes without completing a full cooling cycle. It’s usually the result of some sort of electrical issue in the system. Short cycling presents both immediate and long-term consequences for the air conditioner. The immediate effect is that the air conditioner won’t be able to properly cool the home. The long-term consequences are that the system will wear down faster, making it more prone to developing issues the longer it’s allowed to short cycle. You should call for repairs as soon as your air conditioner starts short cycling, so you can mitigate the damage as much as possible. Otherwise, you might have to replace your entire system earlier than you had intended to. Climate Masters offers a full range of air conditioning services in St. Augustine, FL. If you need help getting your air conditioner to finish the summer in good condition, we’re here for you. Contact us today to schedule an appointment with one of our professional technicians.